A Facebook Page isn’t equivalent to an account. Rather, it’s an entity on Facebook that can be managed by many people with their own distinct accounts. Before you get started, read the Facebook Pages Terms. The terms clarify some of the expectations for owning a Page and who can create a Page for a business. If you violate these terms, your Page may be disabled, which could negatively impact your business. On the same note, if you use a personal Timeline to do the work of a Page, your Facebook account will almost certainly be disabled for violating the Statement of Rights and Responsibilities. 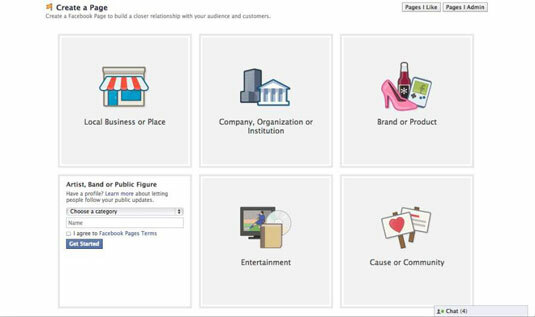 If you haven’t already created an account on Facebook, it’s recommended that you do that first before creating a Page (although you don’t have to). If you don’t want to, you can still create a Facebook Page. If you go this route, you’ll have an additional step of entering your e-mail address and creating a password for your Page’s account. Pages can have multiple admins. If you plan to have other people managing the Page you’re creating, they can do so from their own accounts. There’s no reason to share the e-mail address or password with anyone. In fact, doing so violates the Statement of Rights and Responsibilities. So use your real e-mail address and birth date; don’t create a fake persona just for the Page. Log in to Facebook with your username and password. Navigate to the Account menu (down arrow), located at the right corner of the blue bar, and choose Create Page from the drop-down menu. The Create a Page page appears. Click the category your Page falls under. When you choose your category, a registry field appears. Choose your subcategory from the Choose a category menu. Enter the name of your Page into the Name text box. Use the exact name of your business, just as you need to use your real name on your Facebook account. Anthony’s Pizza at 553 University Ave. Select the check box to agree to the Facebook Pages Terms.